Regazzoni (Ferrari), Jody Scheckter (Tyrrell) and eventual winner Emerson Fittipaldi (McLaren). I hope you like the photos above. However, like any artist, I am never completely satisfied and amongst these, flaws are revealed for, as always an unmodified photo never lies. I have noticed that this car would never make it round an installation lap without one of its oil radiator hoses in place, nor the rear airbox retaining spring clips; having checked the model, this is indeed the case. The model was finished rapidly for a show and had a deadline, a situation I always dislike. Additionally, the inboard offside half-shaft boot is split and that wouldn’t last many laps either! The medical air bottle is missing due to pressure of time and once the show was over extra parts like this have remained in the parts box. Therefore, in time for the second photo-shoot, I hope to have addressed these aspects. Dust seems to photograph particularly well and I am sorry about that, perhaps I can watch out for that second time around too. 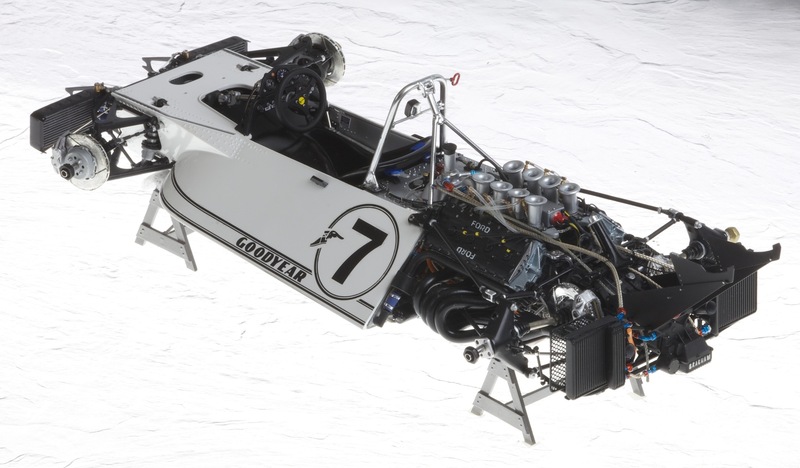 Looking beyond all these evidences of handmade craftsmanship in a busy world, I hope you enjoy these extra images and the mouthwatering detail lavished upon the winning BT44 at Watkins Glen 1974. 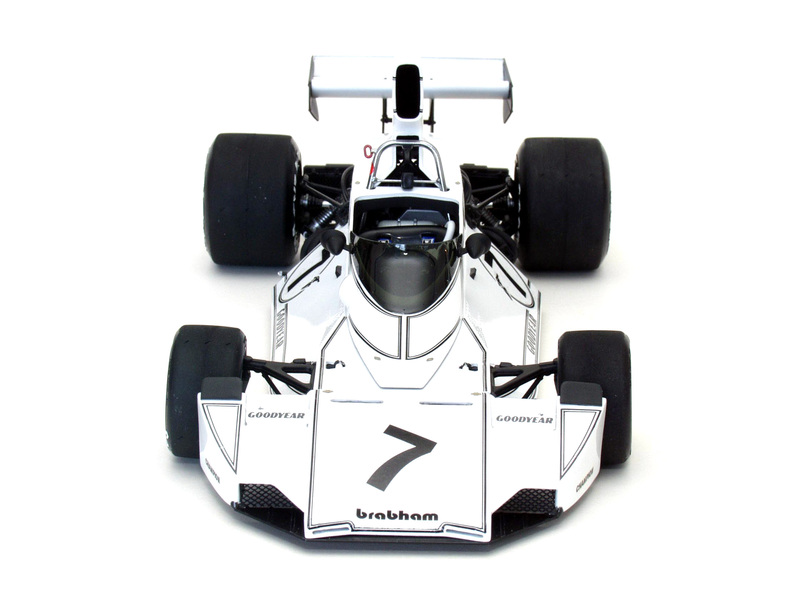 This particular model was originally commissioned by Gordon Murray in 2005 when he asked me to take his Tamiya 1975 BT44B 1/12 unbuilt model and build it as the 1974 Watkins Glen winning BT44. The reason for his preference, was that the pure white almost untouched bodywork was aesthetically more pleasing to Gordon than that of the later Martini sponsored car. Not taking commissions generally (mainly because this necessarily stops me building cars for my own collection, which one might understand when consideration is given to how much time-off, a full time vet has for such endeavours), I accepted his request as a matter of privilege and honour, having been asked in the first place. I had first met Gordon in the original McLaren factory in the Sheerwater district of Woking earlier that same year when I took along the McLaren M19C for his personal viewing. Gordon’s gracious and generous approach contrasted my nervous less confident manner when in such celebrated company. I met Gordon a couple of further times and his gentle way soon helped me feel at ease in the presence of such a legend. I immediately set-about building three BT44/44B monocoques to an exacting standard having spent time with BT44B/2 in the workshop. I soon ran out of time as I prepared one for Gordon (destined to become a BT44) and the second and third monocoques which were to become my own BT44 and 44B. 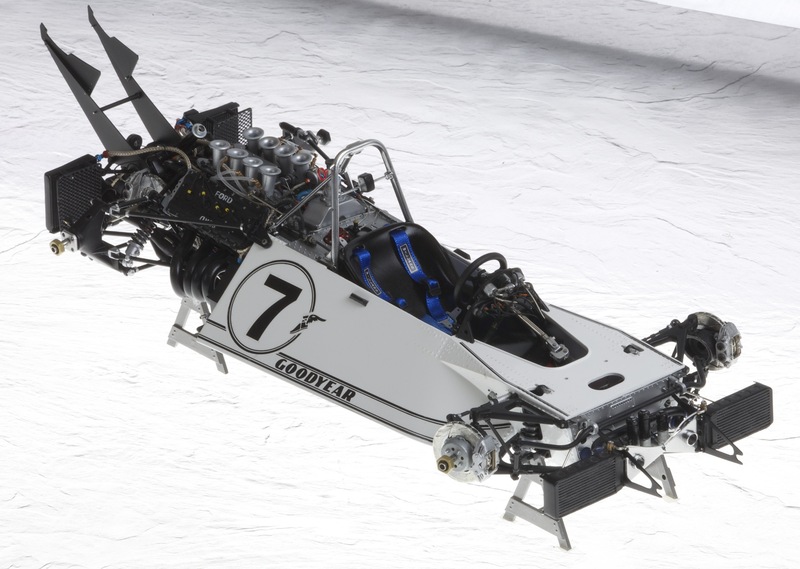 Therefore, as summer 2005 became autumn and then winter, I elected to put to one side the two completed monocoques for myself and concentrate exclusively on the one for Gordon, this being completed for January 2006. I then had the honour of visiting Gordon in his home, to present the finished car. Many of the photos on the home page and below, are of Gordon’s car. I have added some photos of my own BT44 and 44B (started in 2008, finished in ’09) which were completed, just in time to show them at a model show at Donington race circuit… (I mean ‘just in time’, a real rush when deadlines are given, final touches in the hotel room etc). 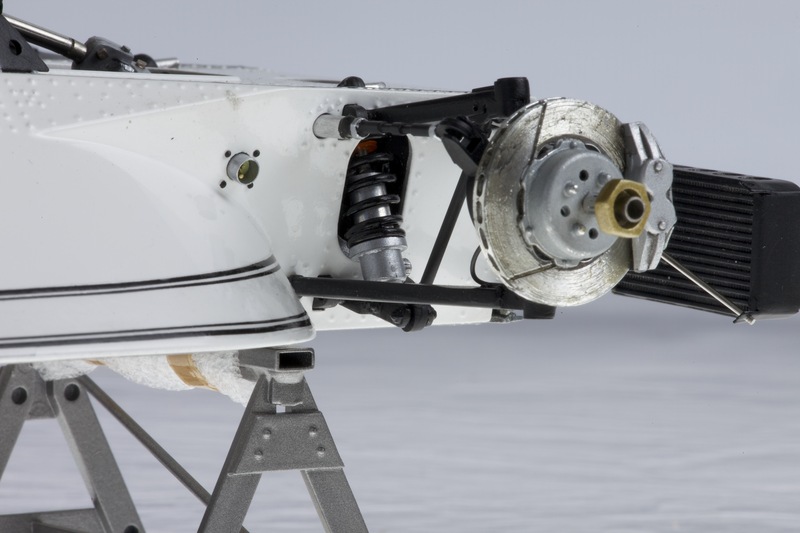 Essentially, the Tamiya monocoque is very good and measures a little smaller in scale than the real monocoque with only minor details of difference here and there. The dimensional variations were not worth pursuing, however there was much scope for super-detailing the rear of the monocoque and also the front bulkhead and closing panel supporting the anti-roll bar and master cylinders. Studying these areas revealed the original engineering to be composed of a nickle-plated hollow square-section steel cross member at the frontmost aspect of the monocoque floor. On this beam, the master cylinders were bolted and through which, travelled the push rods from the re-constructed foot pedals within the footwell. Inner aspects of the front bulkhead were largely hidden, the front closing panel being of aluminium construction, the front anti-roll bar brackets bolted through this to a transverse steel bulkhead member within. I replaced the straight section of the anti-roll bar with aluminium tube, to improve realism. 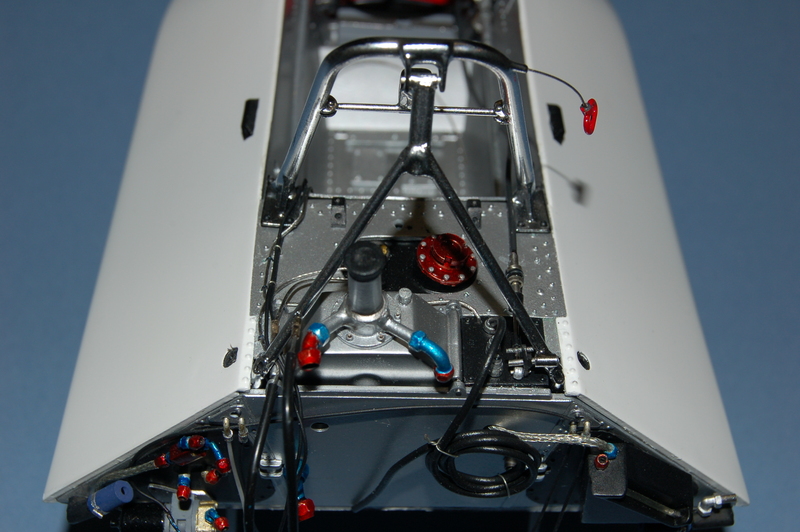 Additionally, the two nosecone supports with the transverse centrally pinched panel with brake cooling access were replaced, as were many small parts to improve scale-appearance. The forward water radiators were detailed and plumbed appropriately replacing the plastic balance pipe with one fashioned in brass. Water radiator plumbing included bleed pipes and water temperature sender, jubilee clips etc. The front brakes were super-detailed with pads, retaining clips and hydraulic plumbing. 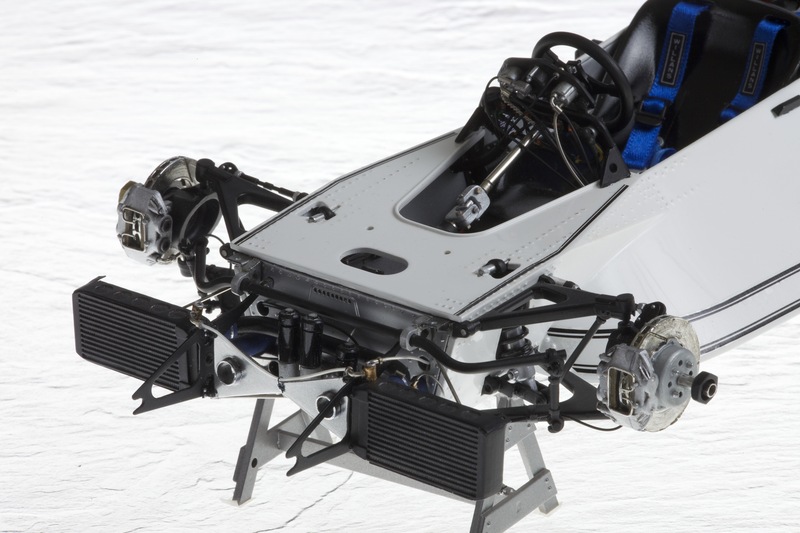 The seat was remade in Sylmasta modelling putty/resin to fit the inner monocoque which now sported an entirely new roll-over bar with corrected footings behind the driver’s shoulders. The tank top was super-detailed with throttle assembly, oil temperature sender cable, routing for tachometer cable and fuel pressure line, inclined fuel filler, as well as the electrical output to the ignition box and fuel tank breather lines. 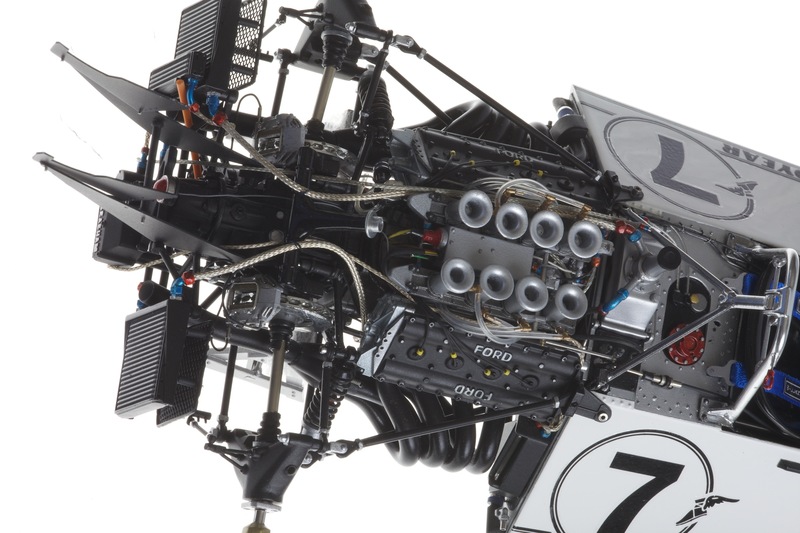 All these aspects carried onto into the fully-detailed engine which additionally featured scratch-built exhaust pipes (including secondary to primary spring clips), full set of lower engine ancillaries including oil pressure sensor, clutch and brake lines, full plumbing of fuel system on the monocoque closing panel LHS. 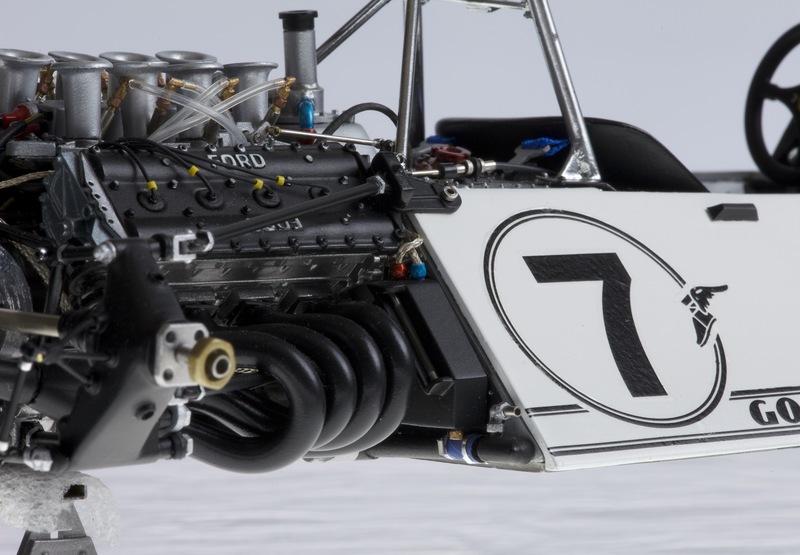 The BT44’s external catch-tank was made and plumbed into the oil tank within the monocoque with its overflow pipe being routed over the gearbox. The forward radiator bleed pipe was fed through the monocoque closing panel towards the water header-tank at the rear of the cylinder heads. All oil lines were replaced with braided equivalent variably covered with shrink-wrap anti-chafing protection where passing over vibrating aspects of the DFV especially. The ignition box was electrically detailed, with accelerator actuation and fuel-plumbing within the vee, including the pancake filter down to the electrical fuel pump and fuel valve in place on the rear left monocoque surface which featured the triangular fuel bag access panels, one on each side. 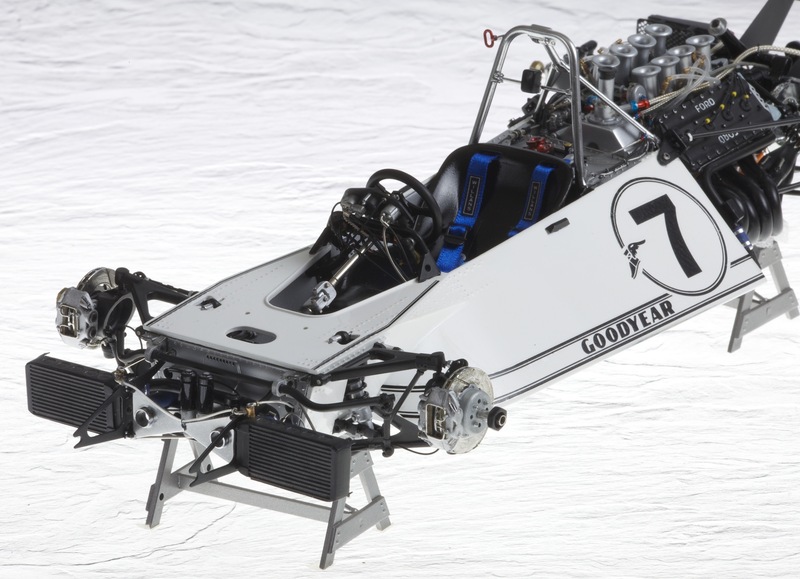 The gearbox was a super-detailed replacement in resin for the overlong and poorly detailed Tamiya version of the Hewland FG400. Around this, brakes were detailed and plumbed, brake cooling duct was manufactured and added to fit via a metal locator with surrounding collar for the undersurface of the airbox when fitted. The rear oil radiators were detailed and fully plumbed with aeroquip-like braided tube. The rear uprights were super-detailed with replacement parts, as was the wholly replaced rear anti-roll bar and links. Radius rods were replaced with aluminium tube, retaining the Tamiya ‘rose-joints’, in this model. The rear wing support stays were replaced with thinner gauge material in keeping with scale appearance. 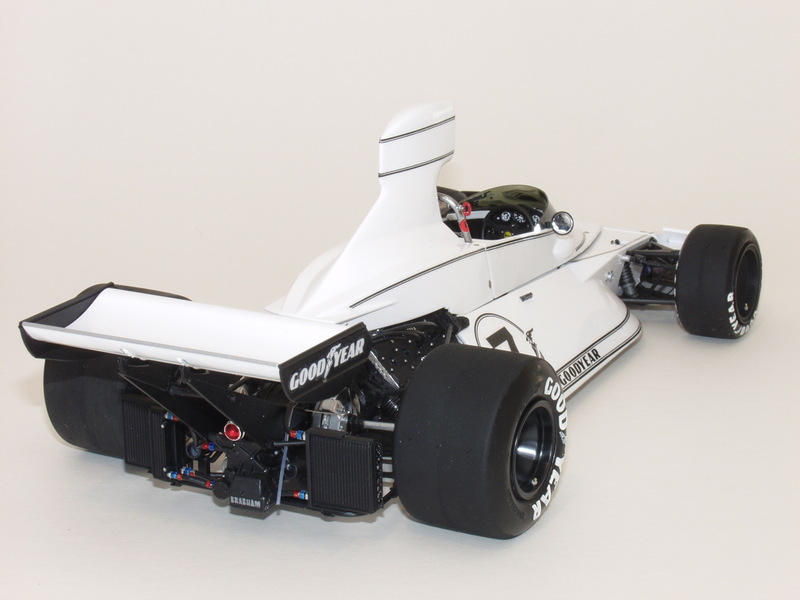 Bodywork changes included an essentially scratch-built front nosecone having a broader front width than the Tamiya BT44B equivalent. This necessitated knock-on changes in the radiator ducting to the sides of the main part of the nosecone. Additionally, an improved splitter was made, looking more realistic. 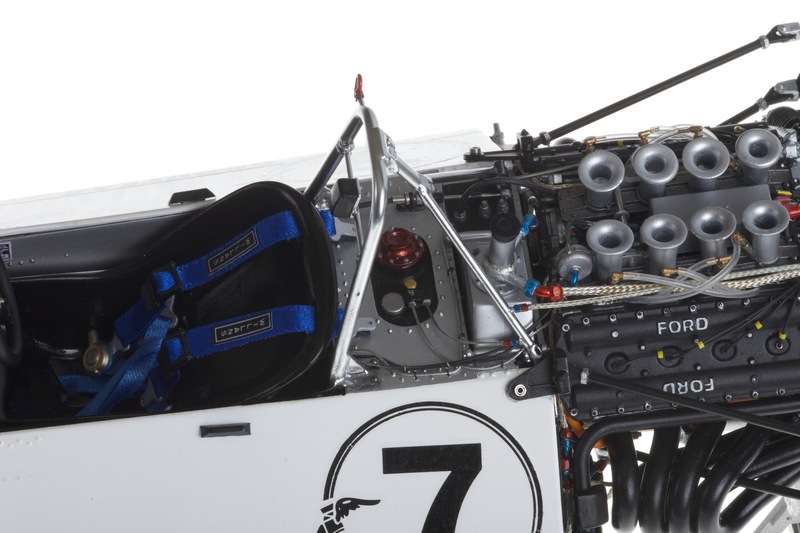 The cockpit surround was re-profiled inwardly and at its rear, with respect to how it interacted with the monocoque sides and the airbox, where fixings were by Dzus fasteners. The airbox inlet was reshaped for a more correctly proportioned opening and completed by provision of retaining clips at the rear for attachment onto the gearbox maincase. The rear wing end-fences were replaced and the lower aspects appropriately inwardly inclined. The Tamiya provision for a wheel retaining nut, is a very narrow screw. I decided to apply a replacement stub axle alternative over this Tamiya screw for improved appearance of the upright assembly when displayed without wheels. This included a resin hand-cast wheel nut, these eccentrically no effort-spared approaches, making for a far better visual result. 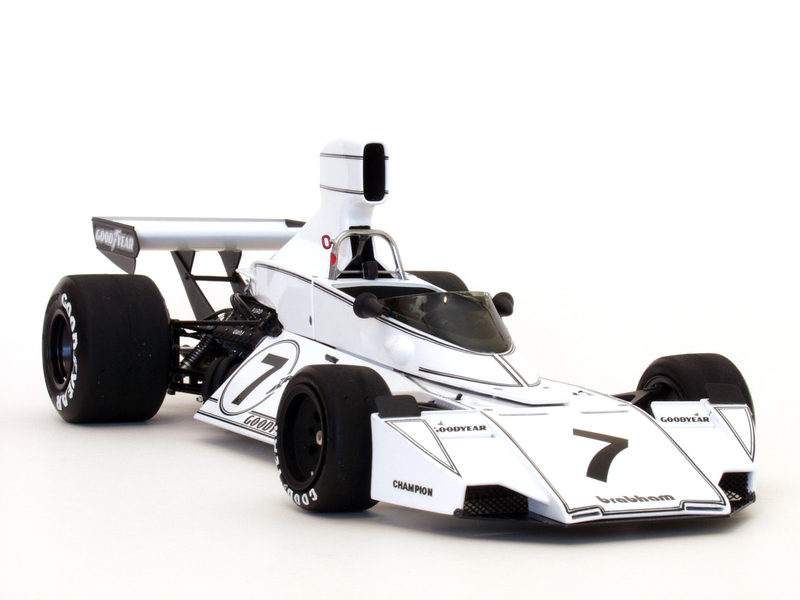 Lastly, decals for this 1974 Watkins Glen car came from a sheet produced by MTR, however these were overly heavy in both appearance and in their construction; nonetheless, it was possible to decal the car sufficiently well for photographs at least. 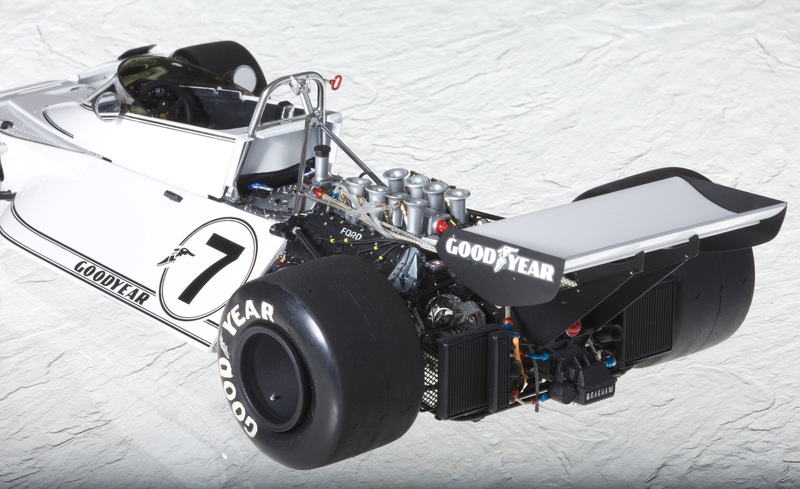 These changes were documented on four sheets of A4, to increase the value of appreciation when comparing this model with that ‘built from the box’ as per Tamiya’s later BT44B. 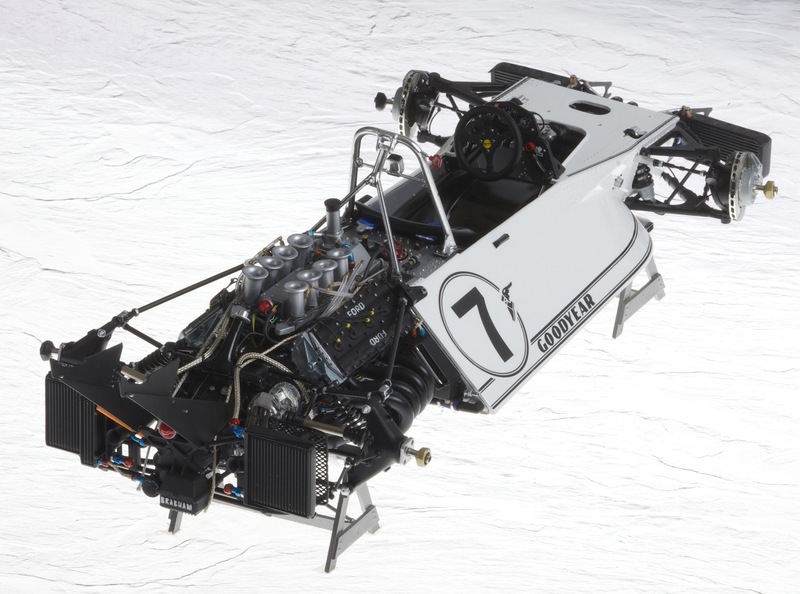 Many of these changes were generic to both BT44 and the uprated BT44B, however some modifications were specific to the BT44.